Although Darnley Coffee House in Bow Street closes at 4:00pm - long before the GhostWalk starts - it's well worth a visit. Situated at the intersection of Broad Street - site of executions, public torture and the weekly market - and Bow Street, 'Darnley's House', as the cafe is known to many, is hard to miss - thanks to the two Crimean cannon which appear to be trained on it's entrance. The building has a colourful history. The Cafe served as stables for a notorious 16th-century brothel, a 17th-century inn, 'Jonet Kilbowie's Tavern', and a 19th-century dairy...at which time it was said to serve the Burgh's best Ice Cream. The tradition of quality comestibles continues to the present day, and Darnley's is justly famed for it's speciality soups, desserts, salads and affordable lunches. 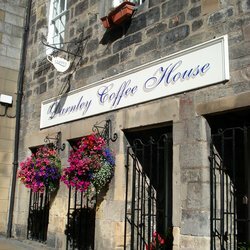 Encounters with the infamous Darnley Poltergeist are, we're glad to say, never a problem for patrons of this pleasant and affordable cafe.